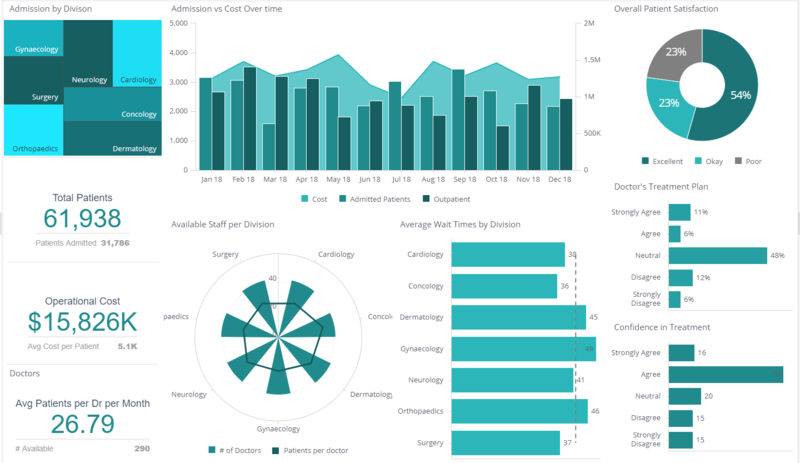 What Can Data Analytics Bring to Hospitals? There are few sectors where gaining rapid business intelligence insights could genuinely be a case of life and death, and medicine is one of them. Hospitals around the world are under ever-increasing pressure to provide first class care to rapidly growing populations, often while juggling funding squeezes or changes to payment plans. Organizing resources, allocating budgets, identifying potential bottlenecks and responding fast to emerging crises are all par for the course – and that’s precisely where business intelligence can help. Hospitals increasingly use data analysis to keep an eye on overall hospital performance and track aspects like patient progress and outcomes, track bed occupancy, improve bedside care, and correct inefficiencies in the way they deal with patients or administer treatment and services. All of which helps them to run a tighter ship, while ensuring that patients get the best possible quality of care. Hospitals have historically been slow to make the switch to digital, but electronic health records are finally becoming the norm. While this can only improve how healtcare is administered long-term, it also presents myriad challenges along the way. Healthcare analytics data is highly sensitive, making security paramount. What’s more, generations of paper records and disjointed, internal computer systems means that simply getting this information into a consistent format for analysis can be a mammoth task. Then there’s the issue of constantly evolving costing and payment models, ever-expanding data pools, and the impact of unforeseen health crises like epidemics. Finally, unlike most other industries, doctors and nurses don’t naturally take a business-orientated approach to their work. For them to engage with BI, you need a clear visual communication method that brings the insights to life in immediately actionable ways, that have clear benefits to patients rather than abstract business implications. Hospitals looking to invest in a BI solution need to demand the highest possible bar when it comes to security, flexibility, self-service and speed. On the security site, high-level encryption and staggered data access permissions are crucial, as is the ability to decide whether to host your BI platform on the cloud or on-site, in line with internal policy. Beyond that, you need a dynamic tool that will grow with you, allowing you to add unlimited data sources and volumes without this impacting on performance. This also needs to be adaptable enough to let you pick and choose the metrics that matter to you, as well as those set by regulatory bodies and other authorities, building dashboards and running queries whenever you need to, without relying on your IT department. Plus, of course, you need an intuitive, easy-to-navigate front-end that both medical and business teams can interpret swiftly for real-time results. Sisense is trusted by some of the world’s leading medical and financial organizations, so you can rest assured that we understand your hospital’s security requirements. What’s more, the platform is specifically designed to let you pull in data from disparate sources and clean up inconsistencies, allowing you to treat all your data as a single pool when it comes to running queries and conducting critical analyses. We’ve won multiple awards for our ease of use, customer support and the quality of our dashboards and scorecards. Users from across the organization can build their own interactive dashboards based on vital metrics that impact on their roles the most, using up-to-date data that allows them to respond rapidly to changes on the ground and, even more importantly, anticipate problems before they emerge. The result is a system that allows you to improve interactions with patients, prevent cashflow problems, streamline the running of hospital, better allocate resources – and potentially save lives.